I have nothing but good news. Again, we are swamped getting ready for the Palladium Open House (next week! ), so I’ll try to keep this short. As I’ve noted in previous Updates and Murmurs, Endless Dead™ is going to be another crowd pleaser. It is packed with world information and data that will help to expand your campaign and devise new adventures. In addition to a zillion random tables that should spawn scores of ideas, there are tables for survivor caravans and safe havens and military bases. In fact, there is a wealth of information about the military and the role they may play in surviving in a world where the Dead Reign. Plus there are five new O.C.C.s (as a G.M. I think the Wheelman and Zombie Researcher are my two favorites). And the zombies . . . the zombies are truly unlike anything you’ve ever seen before. How cool is that!? Yep, fun and epic adventure awaits. So send in your orders now. “Official” material for Rifts® Lemuria, plus cool source material for Palladium Fantasy®, Nightbane® and the City-State of Lazlo™ for Rifts® and some other good stuff. See the complete description elsewhere in this Weekly Update. Everything has shipped! All I have left to do is call a bunch of the Top and Ultimate Insiders. Will try do so ALL weekend as I work in the warehouse to get things finished for the Open House. I hope all of you “Insiders” love the PDF and hardcover editions of Rifts® Lemuria. I added an extra art print in the Ultimate Insider package and two extra prints in the Benefactor package. I designed it as the kind of special package I would want to get if I had ordered one. Heck, I signed so many books and art prints that for a few days there it felt like Christmas Surprise Package season had started early. Then, I was so concerned about doing the Benefactor package with original artwork and other good stuff just right, that I personally packaged each and every one. They all went out on Monday and Tuesday, so they should be arriving today and tomorrow to most of you. Enjoy. My thanks to everyone who participated in Palladium’s first crowdsource funding Megaverse® Insider. Your support and enthusiasm means a lot to us. The next one will be sometime in May for Rifts® Northern Gun™. The following five titles are back in print and available now. The following four titles are at the printer and ship next Wednesday, May 2, 2012. Order yours this weekend to ship along with your copy of Endless Dead™. Sales continued to improve this week as momentum builds for new and back in print titles. There is most definitely growing excitement. 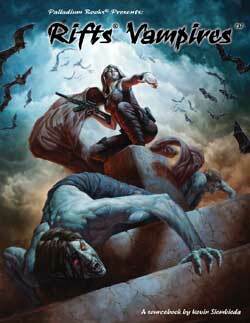 Rifts® Vampires Sourcebook. It is next. I’ll really jump into it with both feet right after the Open House. Robotech® The Genesis Pits™ Sourcebook – June. Harmony Gold and I gave John Zeleznik the go-ahead for the cover just this week. Rifts® Northern Gun™ 1 – June. Artwork is coming along nicely. Rifts® Northern Gun™ 2 – July. Artwork is coming along nicely. Beyond the Supernatural™ sourcebooks and more. Four new T-shirts, a new coffee mug, and Rifts® miniatures are coming in May. All of the following will debut at the Open House and be made available online afterward. Northern Gun™ (logo, white on black T-shirt). Wilk’s Laser Technologies™ (logo, red on black T-shirt). Dead Reign™ “Survive, or die trying” (white art and slogan on a black T-shirt). Imagination Unleashed (Black imprint on red T-shirt featuring the Panther Shark from Lemuria). Back in print: The ever popular Property of the Coalition™ T-shirt; black on sports gray. Plus Palladium Fantasy® coffee mug – red on black mug. Plus Rifts® miniatures – old and new. It’s next week. We’re ready. All we need now is YOU. Come join the fun for a day, the weekend or an evening. We are going to have all kinds of new products, back stock books, four new T-shirts, new Palladium Fantasy® coffee mug, games, panel talks, auction, costume contest, Palladium staff, artists, writers, revelations, and fun you’ll talk about for years to come. It is worth the price of admission just to meet and chat with the many Palladium artists and writers from around the country. See the complete description at the end of this Weekly Update. NOTE: The Open House is not an annual event and there are currently no plans to host one in 2013. We’ve found hosting every two or three years seems to work best for everyone. Hotel Rooms. I have no idea what’s still available. Give ‘em a call if you still need a room. The Plymouth Comfort Inn Clock Tower Hotel will hold the $69.95 price for a room double or king. HOWEVER, they are no longer being held and rooms may sell out; first come, first served. ● Call 734-455-8100 and you MUST tell them you want a room at the Palladium Books rate ($69.95 plus tax). Comfort Inn Plymouth Clock Tower Hotel; five minutes from Palladium Books and right off I-275 (Ann Arbor Road exit). We’ve been so busy trying to get stuff done for the Open House (and other things) that we forgot to post the Endless Dead™ Sneak Preview until today. Sorry about that. It is now available as a FREE Sneak Preview on DriveThruRPG.com. Enjoy. In addition to FREE sneak previews like Rifts® Lemuria, Thundercloud Galaxy™, Rifts® Vampire Kingdoms™ and Endless Dead™, there are special products like the Palladium Fantasy® Game Master Kit – now available on DriveThruRPG.com for only $5. Gamers who loved the Rifts® G.M. Kit will love this one too. Like its predecessor, the Fantasy G.M. Kit is written by Carl Gleba and comes with maps, combat matrix, character sheets, spell list, and 20 pre-rolled characters created by Julius Rosenstein (and used by Julius and me for years and years in games at conventions). And it is available at the same low price of $5 for a wealth of material and helpful Game Master resources. 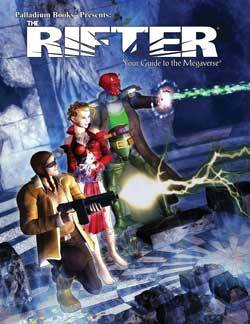 Don’t forget, DriveThruRPG.com also offers 90+ back stock titles, including back issues of The Rifter®, and first edition rule books for Rifts®, Palladium Fantasy RPG®, Heroes Unlimited™, The Mechanoid Invasion® Trilogy, and lots of other good things, of which the Rifts® Game Master Kit is just one. ALL available as PDF downloads at reasonable prices. And there is MORE to come. I have had Alex toss up a few new collectible items, including a couple hardcover editions of Rifts® Lemuria, a Gold Edition BTS and more action figures. He and I will try to post some additional good stuff over the weekend. As always, there are all kinds of new toys and action figures in my online store. All items are from my personal collection. More Palladium collectibles will be added every few days. We try to add at least a few things a couple times a week, every week. We’ll keep them coming if you keep buying them. We have a ton of things to do for the Open House (bag several hundred T-Shirts, rearrange the warehouse, build new shelving, clean the office, do the gaming schedule, etc. ), so that’s it for now. Stomp out zombies and game on! Endless Dead™ is epic and will ship May 2, 2012. The zombie hordes grow in number and strangeness as we reveal Fused Zombies and weird amalgamations of walking dead. Can humankind survive? Where is the military? What’s next for the survivors of the zombie apocalypse? This epic, 96 page sourcebook contains horrifying new zombies to haunt player characters along with new character classes (O.C.C.s) and tons of tables for detailing Survivor Hideouts, Safe Haven Communities, Death Cults, military units, military bases and more. Survival is not enough. The time for war against the Endless Dead™ has come. 7 new types of weird zombie amalgamations including Fused Zombies, Multi-Zombies, Parasite Juggernaut, Silent Sloucher, Spare-Parts Thinker, Twin Speedster, Fast-Slow Zombie and Walking Grave, plus variations. 5 new O.C.C.s include the Wheelman, Zombie Hunter, Zombie Researcher, Survivalist and Sentinel. The Military. An expansive section on the military and their response to the zombie apocalypse. Includes many random tables for the creation of military units, military bases and encounters. Vehicles. Stats for specific types of vehicles and rules and tables for adding customized armor, weapons and anti-zombie defenses. Vehicle combat rules and zombie-fighting in vehicles. Random tables for military bases, police stations, gun stores, buildings, suburbs, business parks, small towns, farmland, wilderness and encounters. 96 pages – $16.95 retail – Cat. No. 233. At the printer. Confirmed ship date May 2, 2012. That’s next Wednesday. The Rifter® is an idea factory that helps players and Game Masters to generate new ideas and keep their games fresh. It provides useful, ready to go, source material gamers can just drop into their ongoing games. A doorway to new possibilities and numerous Palladium role-playing worlds. It offers new monsters, villains, characters, O.C.C.s, powers, magic, weapons, adventure and ideas for your games. It presents new villains, monsters and dangers to battle, and new ideas to consider. Every issue has material for Rifts® and at least two or three other Palladium game lines. The Rifter® Number 58 examines people, places and power. 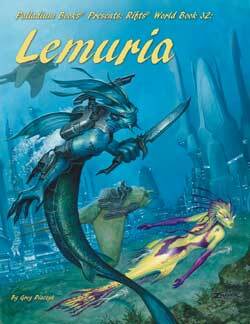 There are new, “official” O.C.C.s for Rifts® Lemuria that include the Lemurian Academic, Citizen, Experimenter and Healer, plus more aquatic animals of note. The Free State of Lazlo provides another unique setting on Rifts Earth, and a Nightbane® short story offers a sense of life after Dark Day. The material for Palladium Fantasy® introduces an array of dangerous beings, and the section on the Kezel and their abilities provides a new kind of superhuman that can be used in Heroes Unlimited™, Phase World® or anywhere in the Megaverse®. Rifts® Lemuria – Official source material, including additional Lemurian O.C.C.s, and monsters and animals. Rifts® Lazlo – The fabled magic kingdom of Lazlo outlined and described. Palladium Fantasy® – 15 new, strange people and monsters. Nightbane® – Short story and source material. Various Settings – The Kezel™: A weird, new superhuman for use in Rifts® Chaos Earth™, Rifts®, Phase World®, Heroes Unlimited™ and even Palladium Fantasy®; includes many powers. The Kezel claim to be human, but their abilities would suggest otherwise. News, coming attractions, and more. Cover by Michael Leonard. 96 pages – still only $11.95 retail – Cat. No. 158. Available now. Rifts® Lemuria is packed with new magic, weapons, living power armor, monstrous war steeds, weapons, and gear suitable for landlubbers and aquatic adventurers alike. The Lemurians are an amphibious people with floating cities and magic-based technology that allows for land and underwater adventures alike. Discover the secrets and people of this lost and forgotten civilization of magic and wonder. Add amphibious capabilities to your Rifts® campaigns and discover new menaces under the sea. Amphibious in nature, Lemurians wage war against the demonic on dry land and under the waves. Their exotic riding animals, weapons, armor and magic are suitable for use on land and underwater. 5 aquatic races including Lemurians, Junk Crabs, Ichthyleans, Merans and Milu. 5 Symbiotic Stone vehicles (and a drone scout). 8 expansive, new O.C.C.s including the Serpent Hunter, Spouter, Oceanic Guardsman, Biomancer Gene-Mage, Birdman and others. 9 monstrous and wondrous Lemurian War Steeds. 10 suits of living Bio-Armor, plus the Wave Strider and Bio-Skins. 10 Biomancy plants and creatures from the Lemurian Gardens. 16 strange and exotic animals. 19 types of Lemurian weapons. 21 new Hydro-Psionic abilities for the Spouter and Hydros Sea Dragon. 50+ new Biomancy spells and a handful of new Ocean Magic spells. Biomancer Gardens, herbs and magic. Symbiotic creatures and Biomancy constructs; some that enable air-breathers to survive underwater indefinitely. Written by Greg Diaczyk with additional material by Matthew Clements and Kevin Siembieda. Tons of interior art by Chuck Walton, Mike Mumah, Brian and Allen Manning, Kent Burles, Nick Bradshaw and Amy Ashbaugh. 224 pages – $24.95 retail – Cat. No. 885. Available now! The Rifter #57 – New – available now. Rifts® Dimension Book™ 5: Anvil Galaxy™ – Back in print – available now. Rifts® Sourcebook Three: Mindwerks™ – Back in print – available now. Palladium Bookmarks, Set 2 – New – available now. Rifts® World Book 32: Lemuria – New – available now. The Rifter® #58 – New – available now. Old Ones™ for Palladium Fantasy® – Back in print. Wolfen Empire for Palladium Fantasy® – Back in print. Rifts® Triax 2 – Back in print. Rifts® Black Vault™ – Back in print. Rifts® Three Galaxies™ – Back in print. Mutant Underground™ for Heroes Unlimited™ – Back in print. Rifts® Mercenaries – Back in print. Rifts® Splynn Dimensional Market™ – Back in print. Rifts® Free Quebec™ – Back in print. 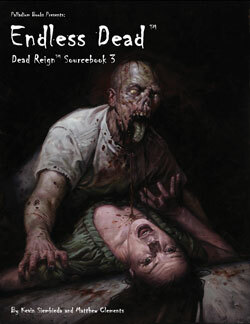 Dead Reign™ Sourcebook Three: Endless Dead™ – New – ships May 2. The following are in development. Unknown to most humans, deep within Mexico the vampires have established entire kingdoms. There they live like tyrants and gods, dominating an underclass of cattle people used as slaves and food stock. Learn more about the vampires, their rivals, allies and the humans who willingly serve their supernatural masters for a chance to join the undead. A must-have guide for those who wish to travel deeper into the Vampire Kingdoms or play as vampires and their human minions. $16.95 – 128 pages. Cat. No. 884. April or May release. On Rifts® Earth, the Black Market is the most prevalent trader in weapons, contraband and magic items outlawed by the Coalition. Explore the day to day business of the market along with its smuggling routes, practices, policies and nefarious products. Encounter the five major Black Market factions in North America and foreign groups like the Yakuza, Green Scarf Sect and the Underground Railroads of Atlantis and the Vampire Kingdoms. New O.C.C.s like the Con Man, Coyote and Venture Criminal. Black Market services, products, practices and customers. Criminal jobs like the Enforcer, Hit Man and Defense Attorney. Major smuggling corridors and routes through Coalition territory. Smuggling methods, both magical and conventional. The Five Factions of North America and other Black Market groups. More equipment from Bandito Arms and specialized smuggling gear. Tables for creating Traveling Merchants, Caravans, Market Outlets, Market Towns, Clubs and Bars, Body-Chop-Shops and more! Information on the Coalition prison system and border security. Written by Matthew Clements and Taylor White, with additional material by Kevin Siembieda and Alex Marciniszyn. 160 pages – $20.95 retail – Cat. No. 886. May release (tentative). The largest independent manufacturer of weapons, robots and adventure gear in North America is Northern Gun™. Located in Michigan’s Upper Peninsula, they have been the premier outfitter of mercenaries and adventurers for decades, and are a major hub for hiring military contractors. With a whole new product line to offer their customers, the future looks bright for Northern Gun™. We haven’t yet decided exactly how the source material and background information will be divided between the two books. Both will contain world information, one will probably have power armor, weapons, and gear, the other will probably have giant robots and vehicles. Both will be epic. The arms giant Northern Gun profiled for the first time! The Kingdom of Ishpeming, a puppet-state propped up by NG. 109 P.A. catalog of Northern Gun products! New weapons, power armor, vehicles, robots and adventure gear. The Ishpeming military, essentially a framework for hiring mercenaries and privateers. The NG Bounty Board, the largest collection of bounties and mercenary contracts anywhere on Rifts® Earth. Hover trains, supply ships and sales outlets. Northern Gun’s relationship with the Coalition States, Triax Industries, the Black Market and others. Interior Artwork by Nick Bradshaw, Chuck Walton and others. 160 pages each – $20.95 retail each – Northern Gun One Cat. No. 887. Northern Gun Two Cat. No. 888. Both are Summer releases. 96 pages – $16.95 retail – Cat. No. 555. Summer release. Available in the U.S. and Canada only. 192 pages – $24.95 retail – Cat. No. 876. Summer release. Admission covers all events. This year, we’ve added “evening rates” for those of you who work during the day on weekends or have to spend several hours driving in. The evening rate starts at 6:00 PM and is $10 at the door. The Open House is three days of Palladium role-playing games (four days for those also attending VIP Thursday; starting around 3:00 PM). Plus you have access to Kevin Siembieda, the Palladium staff and dozens of artists, writers and creators. Heck, it’s worth coming just to meet Palladium creators, get books signed and get artwork, prints and other product. Including rare and one-of-a-kind items. ● Everyone who purchases a weekend admission gets a FREE gift. ● The price of admission includes ALL events – games, panel talks, the whole nine yards. The hotel is inexpensive ($69.00 for a double-bed till April 12, 2012, reserve your room today!) and is a short drive away. ● 90+ Palladium role-playing game events: Rifts®, Robotech®,, Splicers®, Palladium Fantasy®, Nightbane®, Heroes Unlimited™, Dead Reign™, Chaos Earth™, Beyond the Supernatural™ and others! ● Plus open gaming, panel talks, and more. Like seeing previews of artwork for upcoming books, experimental game rules, getting the inside scoop on upcoming products from the people who are doing them, and more. ● Many gaming events are run by the creators who make them. Yep, many of the writers, artists and game designers who make the games and sourcebooks you love, run games. Plus, you’re gaming at the very location where the games are created! It’s a unique opportunity. ● Events run till midnight or 1:00 AM at Palladium, but you can continue to game at the official Palladium Hotel into the wee hours of the night. We have two conference rooms, the largest of which can accommodate as many as 10 different “pick-up games.” If you live within a hundred miles of Palladium, you have no excuse for not joining the fun! ● Open Gaming. We have expanded the area for open gaming. ● New product. You’ll be the first to have the opportunity to acquire three new T-shirt designs, a Palladium Fantasy coffee mug, miniatures, art prints and other cool stuff. Plus get glimpses of upcoming new book releases. ● Meet 30+ Palladium creators. There is no other event where you will meet 30+ Palladium creators. None. And they are there for you. ● Access to Palladium creators. Kevin Siembieda, the Palladium staff, artists, writers and other Palladium creators are there for YOU. Kevin Siembieda is on site from 8:00 AM till 10:00 PM! Most guests are available from 9:00 AM till 8:00 PM (often later). That means you can get 30+ autographs, chat with 30+ creators and get all kinds of inside information. Not to mention have the time of your life. ● The event is hosted at the Palladium warehouse and office at 39074 Webb Court, Westland, MI 48185, so you get to play at the very building where the games are made and see what the place looks like. You might even get a tour of the Palladium offices. You don’t fight big crowds or have to wait in line for hours to get in. There are only 200-300 gamers, but they come from around the world. ● Game with Kevin Siembieda & other Palladium creators. Many of the games are hosted by the very people who make them! Kevin Siembieda, Julius Rosenstein, Carmen Bellaire, Greg Diaczyk, Carl Gleba, Irvin Jackson, Brandon Aten, Mark Oberle, and many other Palladium creators run the games YOU play in. Other games are run by excellent Megaversal Ambassadors and seasoned Game Masters. ● Palladium Creators scheduled to be at the 2012 Open House: Amy Ashbaugh, Thom Bartold, Carmen Bellaire, Nick Bradshaw, Jeff Burke, Braden Campbell, Matthew Clements, Steve Dawes, Greg Diaczyk, Mark Dudley, Carl Gleba, Jeffry Scott Hansen, Irvin Jackson, Michael Leonard, Allen Manning, Brian Manning, Alex Marciniszyn, Mike Majestic, Mike Mumah, Mark Oberle, Apollo Okamura, Noah Page, Ben Rodriguez, Julius Rosenstein, Kevin Siembieda, Kathy Simmons, Josh Sinsapaugh, Wayne Smith, Taylor White, Charles Walton, and others! Past Palladium Open Houses have had as many as 40+ creators and gaming personalities under one roof. ● Enter the Open House Costume Contest and win “Palladium Bucks” and an attractive award. Palladium Bucks and awards are given out for 1st, 2nd and 3rd Place in each of the three categories: Rifts®/Science Fiction, Fantasy and Horror/Modern (Nightbane®, BTS, Heroes Unlimited, etc. ), plus Best of Show. Costume Contest is Saturday evening. We love to see people in costume as Palladium characters. ● Live Auction – Saturday evening – is your chance to acquire the rarest of the rare, collectibles, bargains and unique oddities. ● Enjoy panel discussions with Kevin Siembieda and other creators. ● Artists will be offering original art and limited edition prints for sale, and some even do character sketches (for a price). ● Get the newest books, back stock, miniatures, and specialty items. ● Get original art and out of print items. ● Get your books signed by dozens of Palladium creators. ● Get your photograph taken with Kevin Siembieda, your favorite artists and writers, zombies (really), and a Star Wars Stormtrooper. ● YOU are one of the elite few hundred at this intimate event. ● Meet Palladium fans from around the world. This year we know fans are coming from Australia, England, Germany, Japan and Canada, as well as from across the United States. ● Game till you drop! When we close our doors at the Palladium offices sometime after midnight, there are two gaming rooms at the hotel. And they are available for open gaming ALL night. ● It’s an experience you will never forget and this may be your last chance. For a variety of reasons, this may be our last Open House. ● The Open House is more like a big family reunion or a 3-day party than a convention. YOU are welcomed into our “home” – the Palladium warehouse and offices. YOU are treated like a welcomed guest at Palladium, not one of thousands of faceless, nameless attendees. And you get to hang with Kevin Siembieda and many of the Palladium creators. WARNING: You’ll discover we’re all gaming geeks just like you. Note: Admission covers ALL events. There is NO extra charge to play in a game, participate in panel talks, to meet dozens of Palladium creators, or to get autographs. Note: Please place your orders in advance so we can schedule enough games, panel talks and accommodations. $40 for the Three Day Weekend – Friday, Saturday & Sunday. Walk-ins are welcomed, but the price is $50 for the weekend at the door and after April 15, 2012. $20 for ALL-Day Friday (May 4), 9:00 AM till Closing (about midnight). Same price at the door, if space is available. Open gaming continues at the hotel. $20 for ALL-Day Saturday (May 5), 9:00 AM till Closing (about midnight). Same price at the door, if space is available. Open gaming continues at the hotel. NEW! $10 Friday & Saturday Evenings ONLY: Available at the door after 6:00 PM. Visit till closing, join pick-up games and maybe get into games that still have open slots for players. Meet creators, get autographs, enjoy panel talks, pick up new releases and back stock items, original art, prints, miniatures, T-Shirts and other good stuff. Saturday Evening after 6:00 PM: Enjoy the Costume Contest (starts around 6:00 PM), live auction (7:00 PM). 8:00 PM, gaming, panel talks and chats resume. $10 for Sunday (May 6), 9:00 AM to 5:00 PM. Same price at the door. Worth it just to meet people, get autographs and pick up game books, art, etc. VIP Night Open House “Waiting List.” VIP Thursday has been SOLD OUT for weeks, but inevitably we get a handful of cancellations. Put your name on the VIP Waiting List, and we’ll call you if a cancellation opens up. Call the Palladium office order line (734-721-2903) to get on the VIP Waiting List. Available on a first-come, first served, basis. Placing Your Order: Please include your FULL address and apartment number. Include the NAME of EACH person you are ordering a ticket for, as well as your telephone number in case there is a problem and we need to contact you. Credit Card Payment: Palladium accepts Visa, MasterCard and most credit cards. All Credit Card orders must include: Credit Card No. – Name on the card – Address of the Credit Cardholder – Expiration Date – Telephone Number of the cardholder. Order By Telephone: Call (734) 721-2903 – have your credit card information ready. NOTE: All admission tickets are sold on a first come, first served basis. Due to space and parking limitations and safety concerns, attendance will be strictly limited to a maximum of 350 admission tickets. The special Palladium hotel rate is $69.95 plus tax per Double or King room, but the hotel is filling up fast. $69.95 plus tax per Double or King room. Call 734-455-8100 and you MUST tell them you want a room in the Block Reserved for Palladium Books. Rooms are no longer being held, but a few are still available. HOWEVER, you are taking a big risk if you don’t order today. I’ve been told rooms are going fast! Free “hot” or continental breakfast from 5:30 A.M. to 9:30 A.M. Exercise room open 24 hours. Executive meeting room for all-night gaming; provided a Palladium agent is present in the room. Large meeting room with tables and chairs for several additional games for all-night gaming. The hotel is five minutes from the Palladium office and there are many places to eat. TO MAKE A RESERVATION at the $69.95 price you MUST tell them you want a room in the Block Reserved for Palladium Books. 734-455-8100 tel. 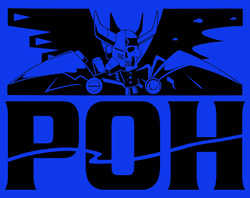 © Copyright 2012 Palladium Books Inc. All rights reserved.